Kaplan Bar Review offers a full range of courses tailor-made for individual needs. Choices include their Complete Bar Review, LLM Bar Review Courses, and a variety of Multistate Bar Exam Courses and Supplements. Kaplan has been in the test prep industry for more than 70 years and is known for its comprehensive review and full-length simulated exams. Their classroom lectures can be attended in person, watched synchronously (live), or on-demand at home, depending on the course. The Complete Bar Review Course includes a heavy schedule of classroom or recorded lectures, outlines, and more than 4,000 exam-like MBE practice questions in a question bank to create customized quizzes. The price includes unlimited essay grading for a maximum level of individual guidance. A free MPRE Review Course is offered online at Kaplan’s website. An outline, course materials, lectures, MPRE questions, and flashcards are available for download. A hard copy version is available with an additional shipping fee. Strict organization and mandatory classroom/online lecture attendance keeps students on track, making it harder to fall behind. Assignments are tailored to improve areas of weakness. The program follows a set course of instruction, homework, practice questions and essay writing, testing, and final review to optimize performance on the bar exam. Lectures are offered in-person and online. Recorded lectures can be accessed anywhere, anytime from smart phones and other portable devices (both iOS and Android). The schedule allows for some wiggle room to catch up on weekends if students fall slightly behind. Ask-an-Expert Support option includes academic attorneys who are available to answer additional questions as needed. For an additional fee, experienced tutors are available to help those who need even more personalized coaching. Technical support is provided for all of Kaplan’s test preparation courses. Kaplan is one of the more expensive options when it comes to reviewing for the bar. The price tag for the Complete Bar Review Course varies by state, ranging from an affordable $1895 (Hawaii) to more than $3,500 (New York, Florida, and North Carolina). Prices will vary according to promotions and specials. The sheer volume of work can be overwhelming for some students. This lengthy course touches on every concept covered on the bar exam, and requires numerous assignments, essays, personal outlines, and practice MBE questions to be completed outside of class for optimal preparation. Learners who struggle with information overload may prefer a more streamlined review that emphasizes a more general overview. Kaplan Bar Review is not scheduled to be available in the following states until summer 2016: Kansas, Maine, Vermont, and Wisconsin. Kaplan has drawn criticism from some test takers that their “exam-like” MBE questions are not as similar to those on the actual bar exam as the practice questions used by some of their competitors. Still, Kaplan stays current when it comes to changes in the bar exam and asserts that students will be ready for the new MBE that will be featured on upcoming exams. Attend lectures in a traditional classroom or online from another location at a pre-scheduled time. With this option, lectures are simulcast for those who log in remotely. Questions can be asked in the chat function to receive immediate answers. Lectures are available 24/7 in the Online Lecture Library if you miss a scheduled lecture, don’t want to attend a physical session, or need to review all or part of one. Internet access is required. 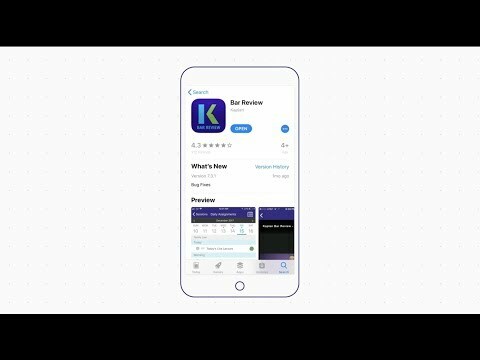 Kaplan Bar Review appeals to both traditional learners who prefer a bricks-and-mortar classroom experience, as well as those who like to self-study online. Kaplan is an established review course that keeps students on track while they study for the bar exam. The flexibility of being able to attend lectures in person or online makes their course a good fit for most students who are serious about passing the Bar. TAKE ME TO KAPLAN BAR REVIEW! Homework assignments include multiple choice questions, practice essays, quizzes, and simulated exams. The Money Back Guarantee has stringent requirements: only first-time bar candidates with a JD from an ABA approved law school who have completed all basic study requirements before taking the exam immediately after the course will be reimbursed. For example, attendance is required for at least 90% of lectures.